Chouquette by Ollella, Cafe Specialize In Choux Pastries @ Petain Road | JACQSOWHAT: Food. Travel. Lifestyle. With what we have in the cafe scene today, there are indeed plenty of options for desserts and tea. Ranging from cafes that specializes with eclairs to macarons and tarts, we now have choux pastries too. 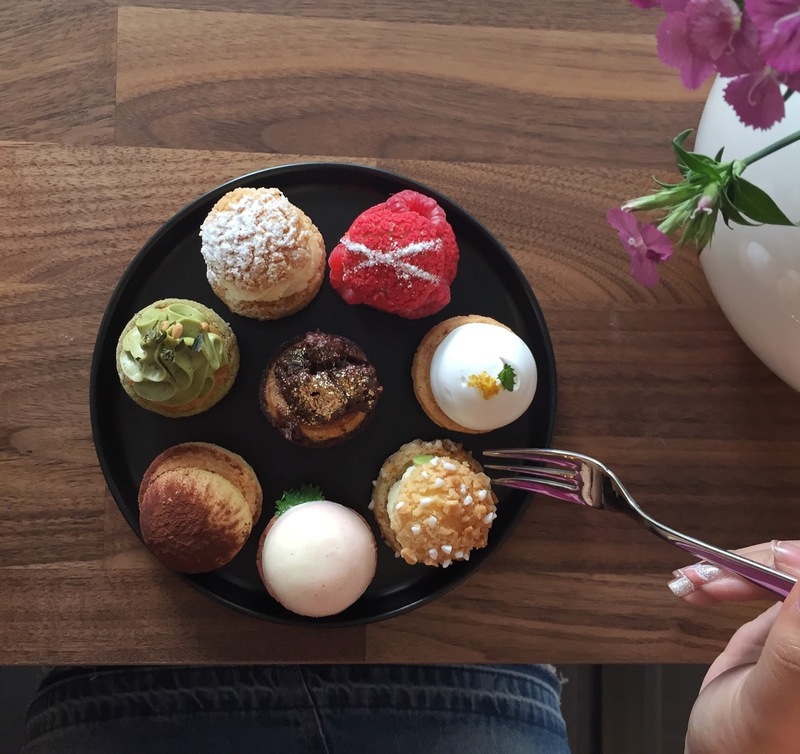 Chouquette by Ollella specializes in making little crisp choux pastries filled with cream layered by different flavours and textures. On the choux menu, there are 2 different choux size - Regular and Mini. The regular ones go at individual pricing (ranging from $4-$5) while the mini ones only comes in a platter of 8 (or top up $6 for 2 tea). There are 8 types of choux flavours here, mainly Vanilla, Apple Cinnamon, Lemon Meringue, Matcha Azuki, Rose Mascato Cheesecake, Dark Chocolate, Tiramisu and Raspberry. We had the Mini Choux Platter of 8 flavours, the mini ones is as small as 3cm diameter each. This platter is prefect for those who can't decide what they want, just like us. We also complete it with two teas which is price at $30, there are 4 types of tea to choose from. The choux pastries were crusty and flaky, yes half of the battle has won in making good choux pastries here. Among the 8 different flavours, my personal pick would be the Vanilla, Matcha Azuki, Lemon Meringue and Apple Cinnamon. The rest fell short of my expectations like the raspberries, it was too sour to take. Anyway, the mini platter is perfect because we get to savour all the flavours without feeling too stuffed. Besides choux pastries and tea, there is a pourover counter where you get to enjoy a up-close pouring session with the barista. Anyway, enjoyed my cosy time here while seated at the bar table facing outside, though nothing much of a view. If you never had a choux before, Ollella is where you need to be.